A condo property value is not strictly dependent only in the property location, building design, and amenities. It is also dependent on how a buyer perceives the interior of the condo unit and one great way to boost your property value is to invest in interior design. There are two main reason why people buy condominium properties and one reason is that a couple or family wants to live in it for a certain amount of years or even for a lifetime. The other type of buyer is one that looks at a property as an investment rather than something that he will be interested in living in. Whether an investor is buying a property for capital gain i.e. buying low and selling high for financial gain, or he’s more interested in having the property rented, investing time and money in interior design and finishing creates a better money value for the condo unit. 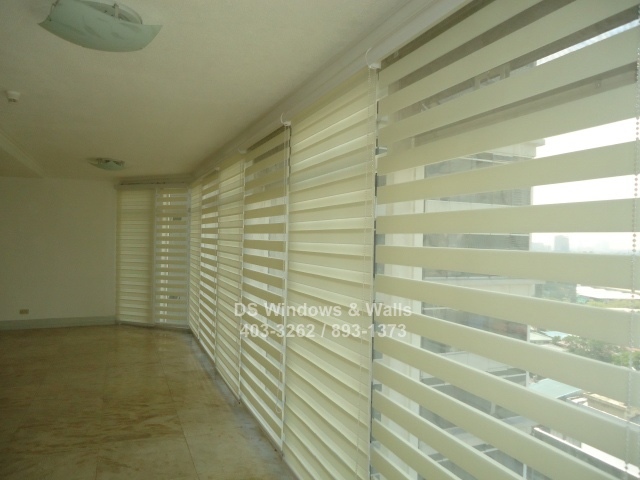 Using white combi shade for creating more peso value to your condo. 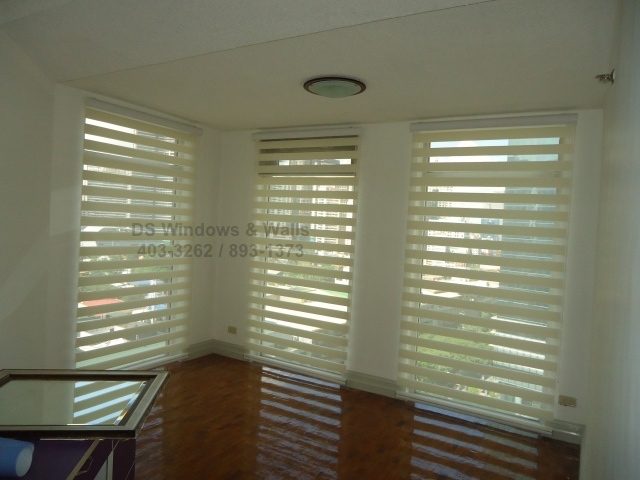 This project was taken from Salcedo Park, Makati and the owner of the property decided to purchase a simple white combi blinds for their window coverings. 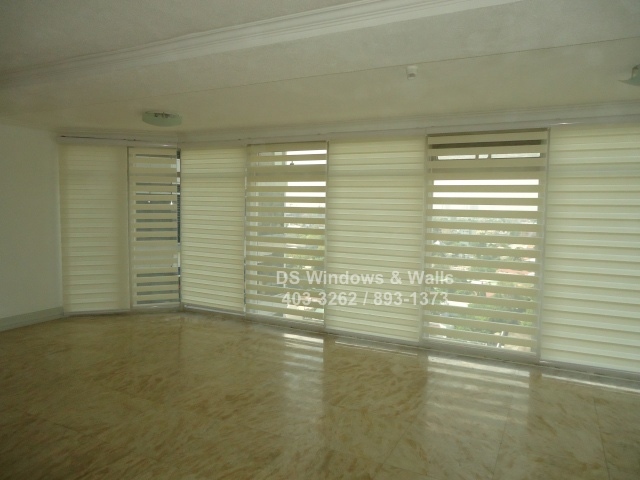 About 23 panels of combi blinds was installed in this unit since it is mostly covered with glass wall. The floor is then covered with shiny and expensive ceramic tiles and the ceiling has a simple white finishing with a few intricate designs and added some fancy lightings. To add some math to this interior design and finishing on boosting property value, say the owner invested half a million pesos (excluding furniture) to create an impressive home interior finish. He/she might potentially be able to demand additional 15,000 to 20,000 pesos to its monthly rent that can potential return his capital investment on interior design alone in about 2 years. Furthermore, when the property has a nice interior finishing, it is easier to find a tenant to rent it or a buyer to sell the property to, compared to when you’re presenting a bare unit to tenant or buyer. Condo as investment needs good interior designing to enhance perceived property value. 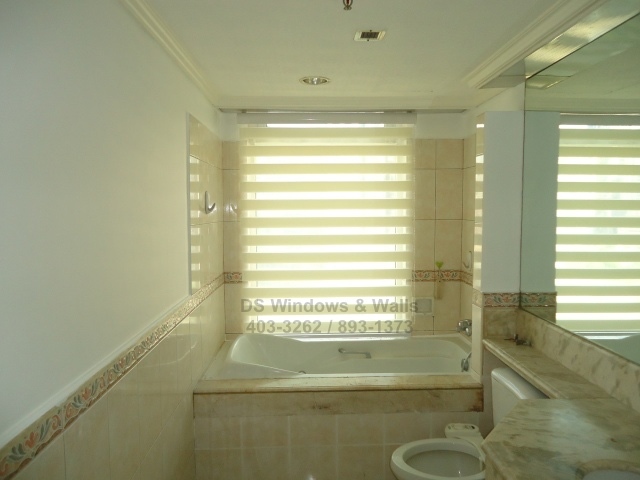 In the photos below, you can see that the bathroom also has a nice bathtub and toilet tiles along with a nice combi blinds window cover that is suitable to a classy condominium unit. A great bathroom can seal the deal to any potential tenant or buyer so it’s best not to take its interior finishing for granted. Elegant bathroom design can help marketability of condo. Our company offers free measurement and estimate if you’re within Metro Manila if you need some advise on your window treatment. Our field agents can show you the several choices of blinds and shades. We also offer wallpapers, carpets, and folding doors for more home interior improvements. Simply call us at (02) 403-3262, (02) 893-1373, (02) 668-9668, 0916-311-3909 or email us at inquiry@dswindows.com. You can also visit our mall branches for more information.